The start of term is looming and preparation and planning is underway. That’s why it’s taken me a week to get around to posting about the launch of, Share This Too, the second social media handbook published by Wiley. My chapter looks at the rise of big data and how data mining can be used to plan and deliver strategic PR activity. It looks at this practically using a case where data was used to identify potential consumer issues for an organisation before they become full blown complaints. By being able to ‘predict’ and address these issues the organisation aimed to reduce its workload. I conclude by arguing that this kind of innovative, data-led PR can help the PR discipline achieve a more strategic position – both within organisations and within the wider business and marketing consultancy industries. Sounds good doesn’t it? Don’t let Brian Solis’ foreword put you off, go and get a copy from Wiley or Amazon. I’m really pleased to say that the CIPR has launched its new Guide to Social Media Monitoring today. 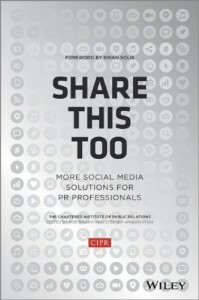 I’ve been responsible for co-ordinating and contributing to the Guide which has been written collaboratively by members of the CIPR’s Social Media Panel. I’ve embedded the document below as well as provided a bit of context and background to its origins. From personal experience as well as evidence from CIPR member feedback it is clear that social media monitoring (SMM) is a key issue for PR practitioners at the moment. And while many practitioners know SMM is increasingly important, they don’t necessarily know exactly what monitoring entails, which tools and technologies are good for certain tasks and how to integrate it into wider strategies and practices. So this became the primary driver for the document: we wanted it to explain what SMM is, what tools are available (both free and paid-for), how they work – and how they differ from other social media management platforms – as well as provide an overview of some of the leading tools in the market. But we also recognised that in order to be practically useful we needed to add some wider organisational context around the tools and technologies piece. So, the guide also features sections covering how to build a business case for monitoring, how to set monitoring objectives as well as how to develop organisational workflows to get the most out of monitoring. The ultimate aim of this is PR practitioners will be empowered to make sense of SMM, recognise its potential and apply it to their organisations. Social media helping PR operate more strategically? The Chartered Institute of PR’s (CIPR) annual State of the Profession report suggests a potentially interesting development for the sector and the role PR plays within organisations. While ‘two-way communications’ is an often misused or misunderstood term its adoption here is potentially significant as it might indicate a shift from a traditionally media relations-focused tactical function to more strategic organisational as PR has to undertake greater research and planning to deal with the complexity of social media. OK. So, this is pretty flimsy speculation but there’s another interesting insight in the report which adds some more – albeit speculative – weight to the hypothesis. While it doesn’t indicate whether PR teams are taking the lead on driving forward a newly converged organisational strategy, these are interesting findings that may indicate that as organisations become increasing socialised and converged this may well be a catalyst for PR to recognise and capitalise on its long-absent organisational strategic prowess? PR, it has long been argued, is best conceived as a strategic management function operating at board level to understand wider society and help shape the long-term vision and operation of organisations. In theory PR plays a central role identifying and connecting internal stakeholders with external ones, building long-term relationships with them, interpreting their changing needs and feeding this information up to the board to shape organisational strategy. The reality, alas, has seen PR all too often become relegated to marketing-led communications and reactive issue management. But is social media forcing a change for the better? As building relationships with online communities and networks through two-way communications becomes increasingly central to an organisation’s success; and social media-empowered consumers and stakeholders are increasingly driving organisational convergence will PR’s ‘boundary-spanning’ role helping join up an organisation’s departments with its external environment help it operate at a higher, more strategic level? I guess only time will tell. Personally, I wouldn’t be surprised as I believe PR has the potential to play a central role in helping organisations adapt to the complexity of social media at a business level – in theory, at least! So, there’s still a way to go before PR operates consistently at a strategic, management level, although social media may be well be the catalyst necessary to shift this reality. But, it’s a catalyst that’s also perceived as a major challenge – both to the profession and individual practitioners. Perhaps it’s digital’s disruptive potential will win out and help the PR industry come of age. I’ve been involved with a great project over the past few months which finally came to fruition last week as the CIPR’s Social Media Advisory Panel launched a new social media and PR handbook. 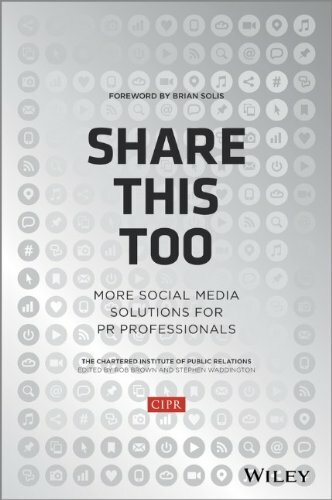 Share This: The Social Media Handbook for PR Professionals contains 25 chapters spanning strategic resources, practical guidance, industry change and tools and technologies across a range of different sectors written by a range of experienced practitioners. My contribution, ‘Social Media and The Third Sector’, features in the industry change section and examines how organisations in the non-profit sector need to think about their communications and campaigning strategies in relation to what I term the ‘new networked reality‘ in which they now operate. I suggest that the nature of the sector should be ideally suited to the socially motivated aspects of this networked space but that a lot of the strategic and tactical changes that organisations need to make can run counter to conventional organisational thinking. The chapter concludes by pointing to a future where organisations will need to become ‘hybrid’ and work with strategically aligned online networks of supporters, partner organisations and the increasingly networked and active public. CIPR Summer Social: is the PR industry falling behind SEO? I’ve been very remiss in failing to mention and big up the CIPR’s Summer Social. The Summer Social is a series of informal meet ups organised through the CIPRs Social Media Advisory Panel (DISC: of which I am a member). So I'm making amends as of now and urging anyone in the PR, marketing and social media sectors to get along to this week’s event as it tackles an oft-debated and really important issue: where do the lines between SEO and PR blur? When is it right and where does it put your clients at risk? “Search agencies are increasingly packaging planning, content development and analytics, into a payment-by-results model. It’s a compelling proposition for a marketing director that is seeking guaranteed outcomes. Now search agencies are starting to use PR tactics such as press releases, by-lined content and wire distribution to drive their campaigns prompting the scrutiny of the role of PR versus SEO. The idea of Summer Socials is to offer PR and marketing professionals the chance to learn and find out more about social media and a host of related topics. It’s less formal and structured than traditional CIPR events or workshop which is a good thing as for the £10 cost we serve beer and nibbles and you get to quiz experts and fellow practitioners about the emerging media landscape. Looking forward, future Socials include sessions from Wolfstar MD Stuart Bruce, MD of Tweetdeck, Iain Dodsworth and Julio Romo with guests form Channel 4 and the BBC. OK. I'm back blogging again. Apologies for the haitus. Twas caused by busy, busy work and too much homelife going on. Does the desire exist among UK PR types for an OpenCIPR? Well, is there? I didn;t renew my membership earleir this year but after discussions with a good few digtial PR types was convinced that there are a number of areas where an organisation of social media and digital PR and communications types would be very useful, e.g. taking the marketing and ad agencies on through thought-leadership; developing and sharing best practice communally (a la Will McInnes' Measurement Camp); knwoeldge sharing, networking, drinking, etc. But this thought led naturally to the next…. in a social/digital age do we need (a) formal organisation to organise? My opinion: no. So I propose re-joining the CIPR and establishing a OpenCIPR grassroots version. This is something David Wilcox and others did with the RSA. And if they can do it with the RSA we can do it with the CIPR. But I need to know a) that this isn't a stupid idea and b) others are willing to get involved. What does the CIPR and NUJ have in common? So I have a confession. I let my CIPR membership lapse last month. I may still renew it, but to be perfectly honest I’m not sure what *real* benefits I get out of the organisaiton anymore. The particular benefits they sold me on during the post-lapse sales call included: meeting other PR professionals at breakfast briefings and networking events and the all inclusive PR Week subscription. But I find I do my best networking online, reading and commenting on blogs. And now by following and engaging others via Twitter (and other social media tools). On top of that I try to get along to events like Twestival; alternative ‘networking’ events organised by non-traditional players in non-traditional spaces. Likewise I find I get all the latest news, gossip and cutting-edge thinking from blogs and Twitter too, rather than PR Week. In short I just don’t think I need to be a member of the CIPR anymore. Of course, this also means I don’t get to claim I’m an accredited PR practitioner or use the professional suffix MCIPR. Like I say, I may still renew but I’m struggling to see the benefits so would welcome others’ opinions. As I mull over these thoughts, it was also good to see another blogger's encounter with his professional organisation, the NUJ. Adam Tinworth's blog post starts innocently enough but soon degenerates/ascends into a car crash of a comment thread. With friends like these…. as they say! "[CIPR] Members' use of social media must be transparent, and they must make extra effort to disclose any potential conflicts of interest. … In this regard, members should be aware that ‘ghosting’ a blog is illegal"
Uh, sorry? Come again. “[M]embers should be aware that ‘ghosting’ a blog is illegal”. Since when? Well, according to last year’s Consumer Protection from Unfair Trading Regulations 2008, misleading marketing practices are illegal. But does this really extend to any blog that is ghosted? Back to the CIPR: “[c]reating fake blogs (‘ghosting’)” is an example of a social media activity that falls under this legislation." I’m not so sure. Yes, I agree a ghosted blog is disingenuous, bad social media practice and yes, I would agree that a blog purporting to be written by a genuine customer but in reality written by a marketing team would breach the legislation. But can you go as far as to issue a blanket statement claiming *all* ghosted blogs breach unfair trading regulations? I think it’s unlikely. So what’s the CIPR’s rational? To be honest, I’m not sure. It always errs on the side of caution, but this is potentially misleading. Interestingly, the statement is a new addition from the original consultation document so maybe they took on advice from someone at the consultation stage. If they did then great. As usual I blogged my submission which was largely similar to the previous year's and also as usual I didn’t receive any feedback on my submission so I don’t know who submitted recommendations and what changes were made.